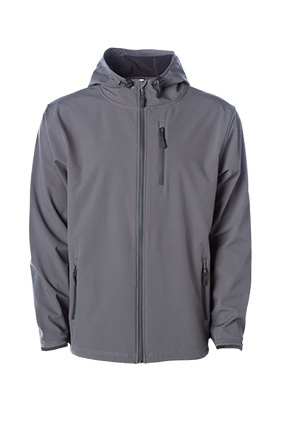 Water and wind resistant Poly-Tech soft shell jacket with a concealed embroidery access for embellishing. 100% waterproof polyester shell bonded to 160gm micro fleece lining. Waterproof Coating: 20,000 mm. Inner PU Coating: Breath-ability/Permeability = 5,000. 3 panel scuba hood. #5 water resistant zippers. Zippered left chest pocket and welt pockets. Media pocket. Toggles at hood and bottom side seams. Antique nickel eyelets. Concealed embroidery access for embellishing.